Shoji screen: a traditional timber and paper construction that makes an ideal room divider. Choose the finish for your decorative screen. 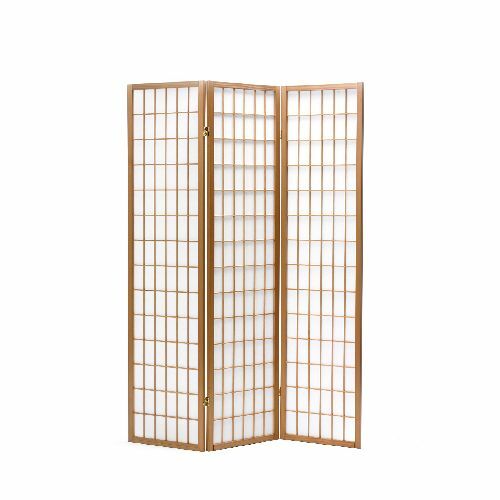 The Shoji Room Divider 3 Panel or Screen is a traditional design and the “one” that usually springs to mind when thinking of screens. These screens offer a high degree of quality that’s hard to find as they use lengths of wood that are devoid of finger joints, consequently these are stronger and more stable than those that are made with finger joints. Eco friendly Scandinavian Spruce timber is used around the outside of the panels, these panels encase rice paper made from pressed pulp. The combination is very pleasing and gives an elegant finishing touch. The subtle diffused light can create an intimate atmosphere for many spaces in the home. The panels are connected using polished brass hinges that can be folded both ways to make your room divider both versatile and stable. Our Shoji screens are expertly finished and available in either Natural or Black and can be stored easily. Free Delivery for your Room Divider takes 1 or 2 working days, usually. The delivery date is guaranteed but it's possible to request an a.m. (08.30-13.00) or p.m. (13.00-18.30) slot, however the request is at the discretion of our couriers who do what they can to comply with your wishes.